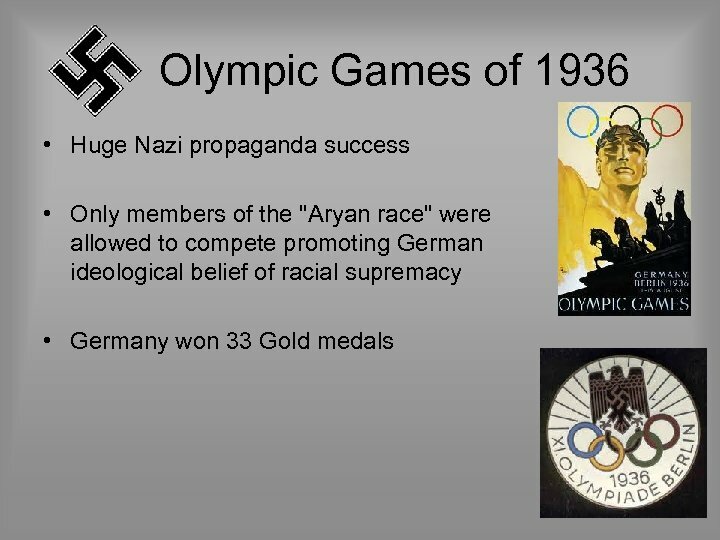 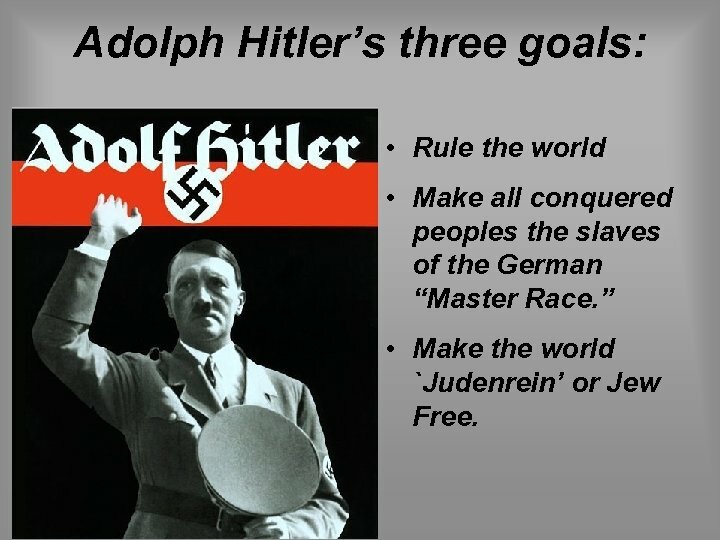 Adolph Hitler’s three goals: • Rule the world • Make all conquered peoples the slaves of the German “Master Race. 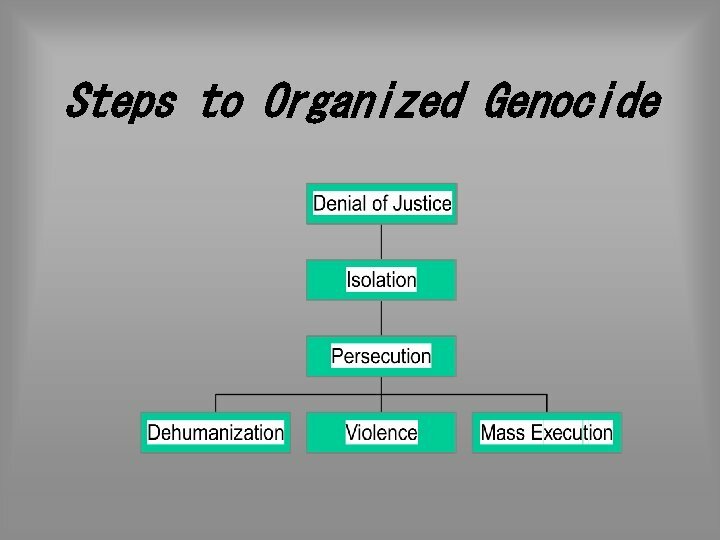 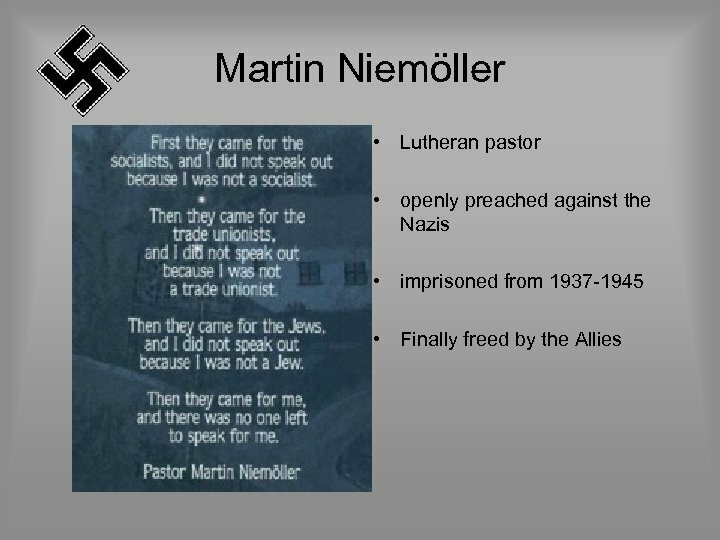 ” • Make the world `Judenrein’ or Jew Free. 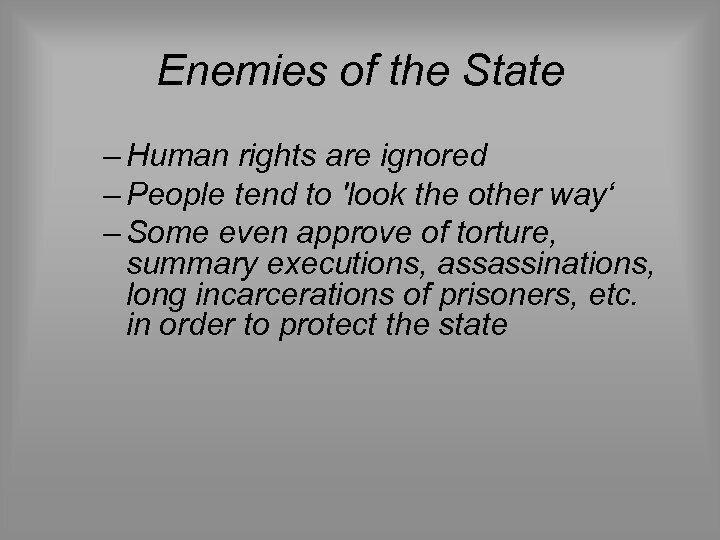 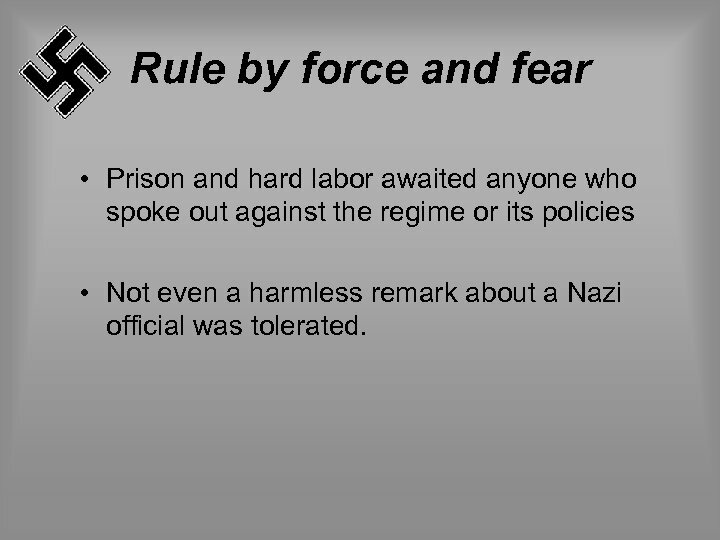 Rule by force and fear • Prison and hard labor awaited anyone who spoke out against the regime or its policies • Not even a harmless remark about a Nazi official was tolerated. 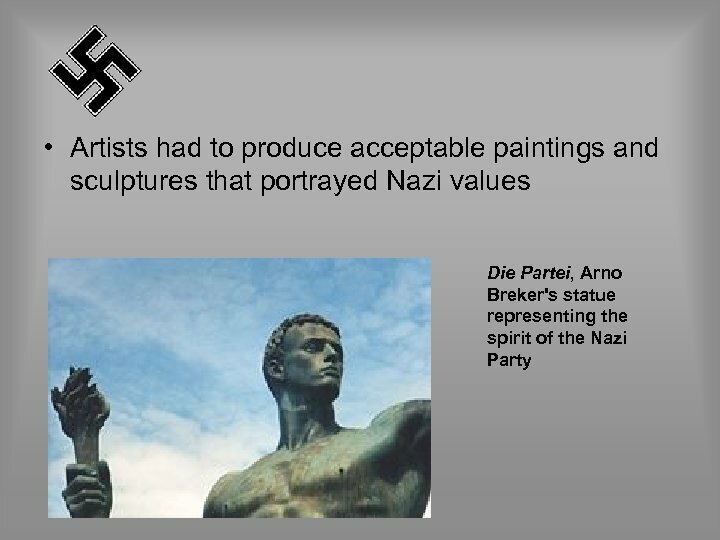 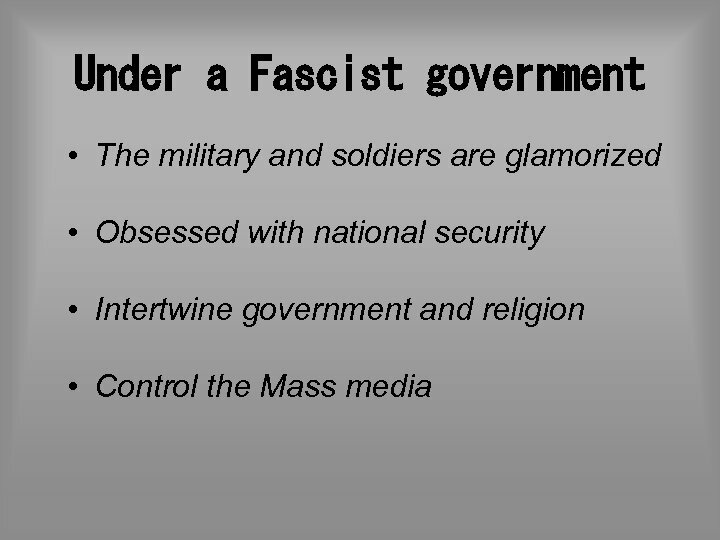 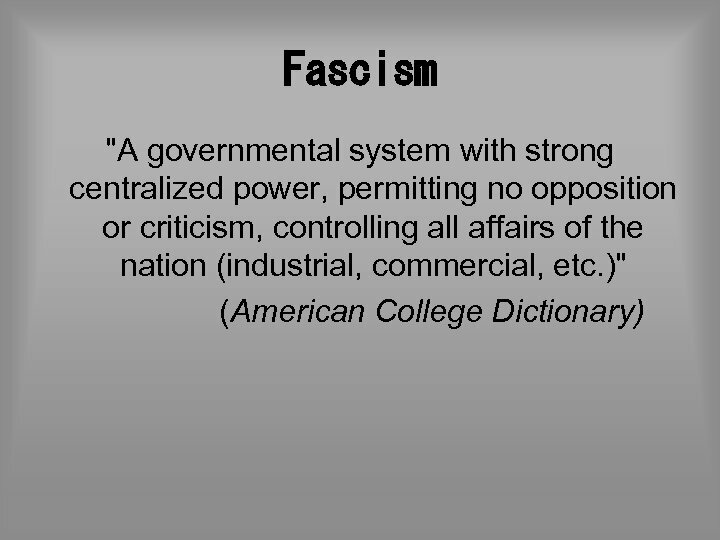 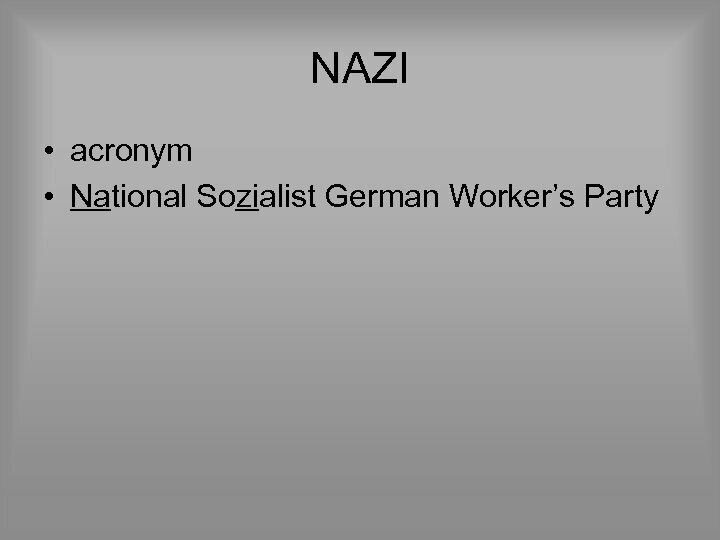 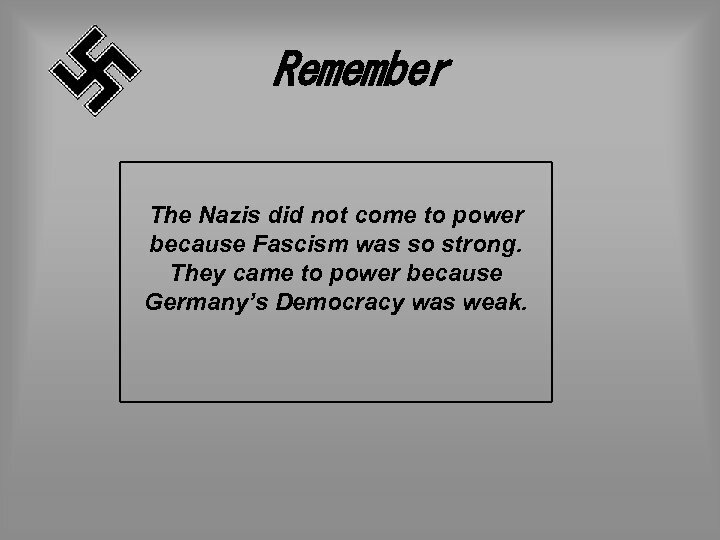 Remember The Nazis did not come to power because Fascism was so strong. 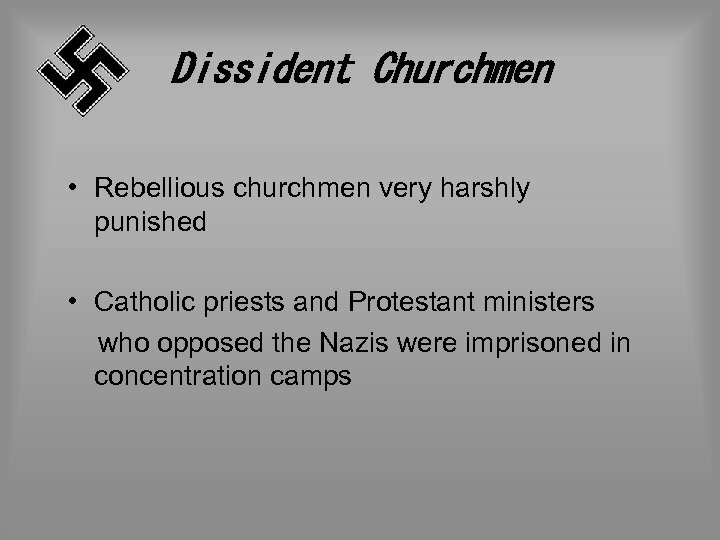 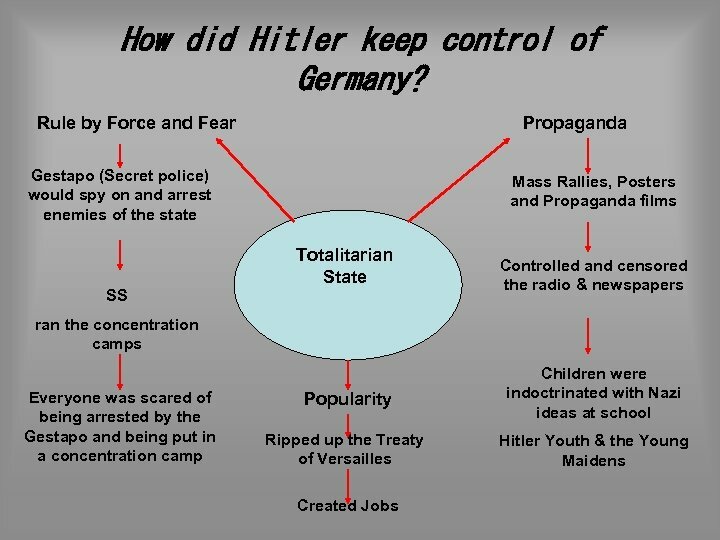 They came to power because Germany’s Democracy was weak. 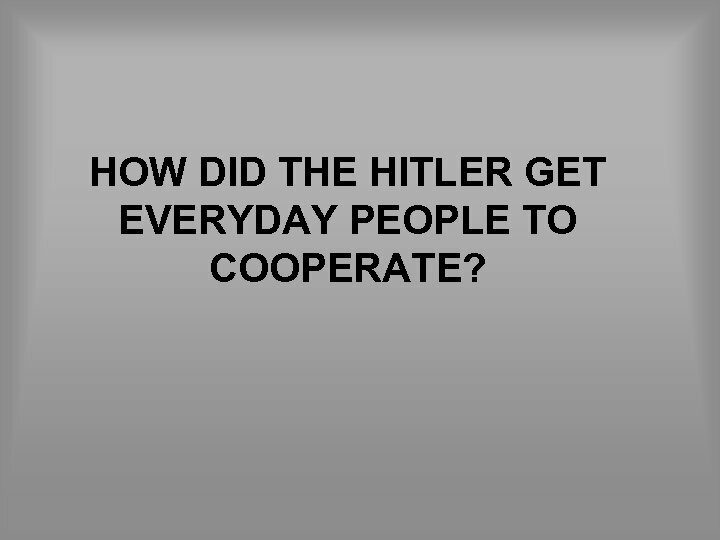 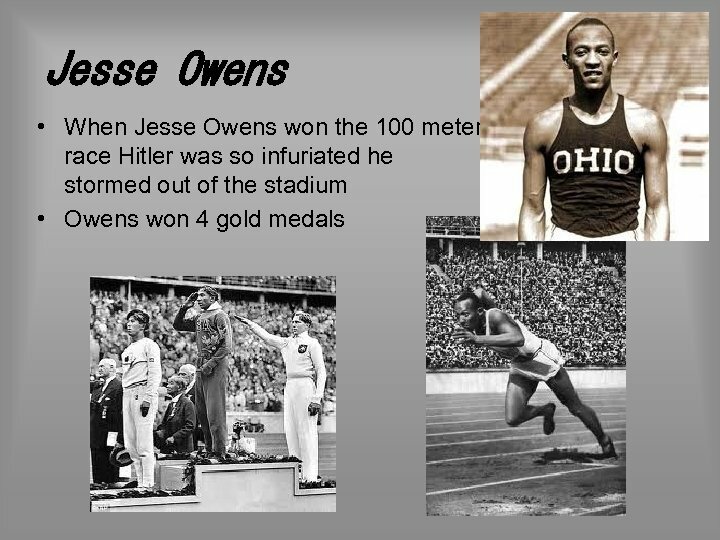 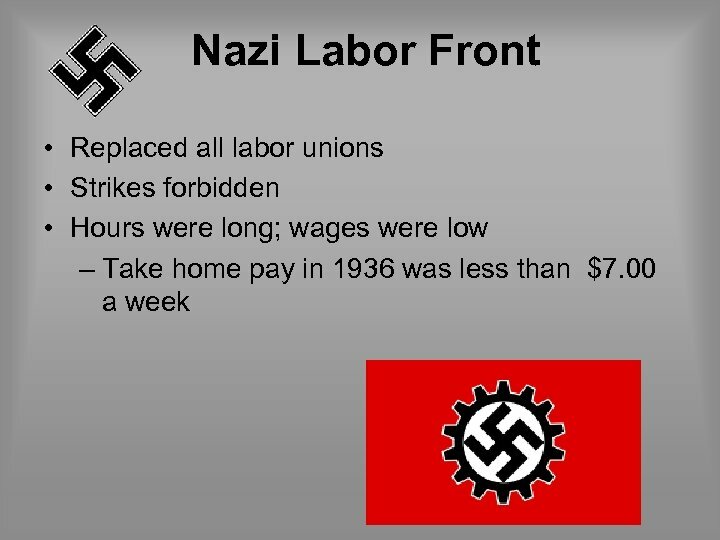 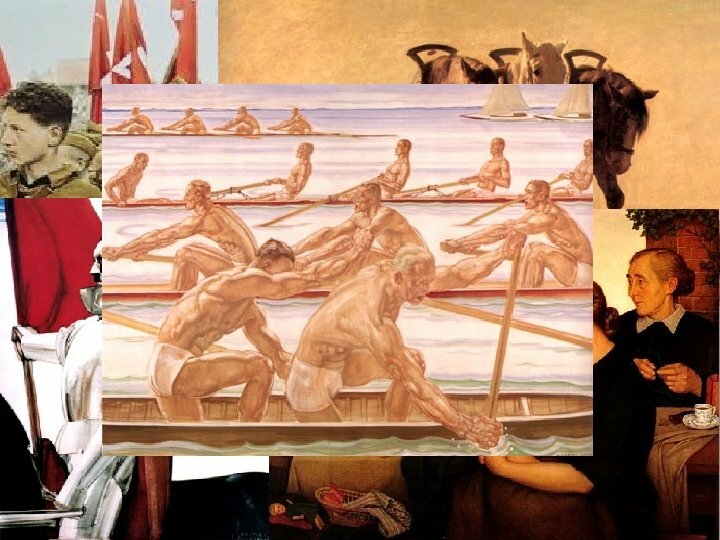 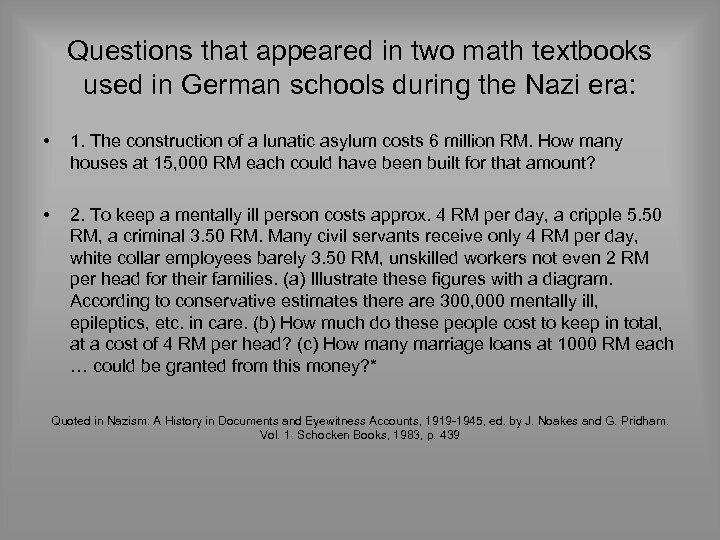 HOW DID THE HITLER GET EVERYDAY PEOPLE TO COOPERATE? 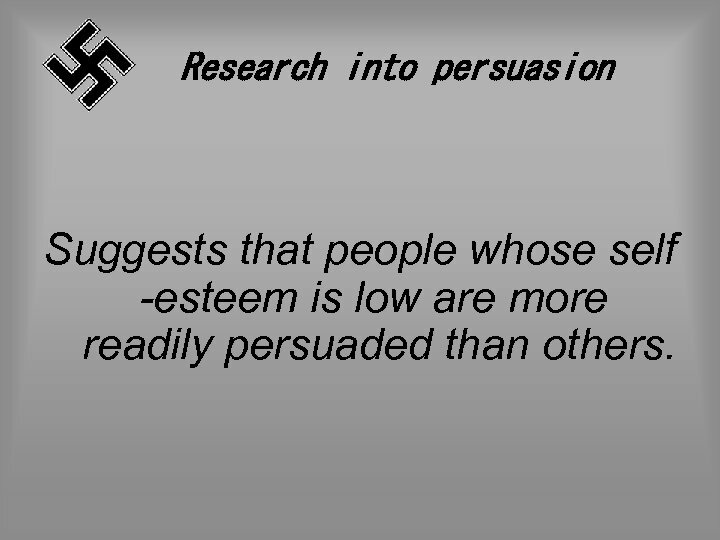 Research into persuasion Suggests that people whose self -esteem is low are more readily persuaded than others. 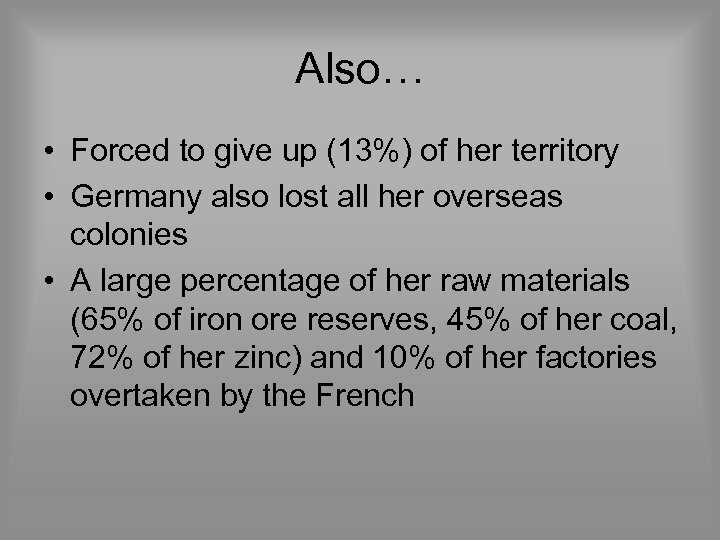 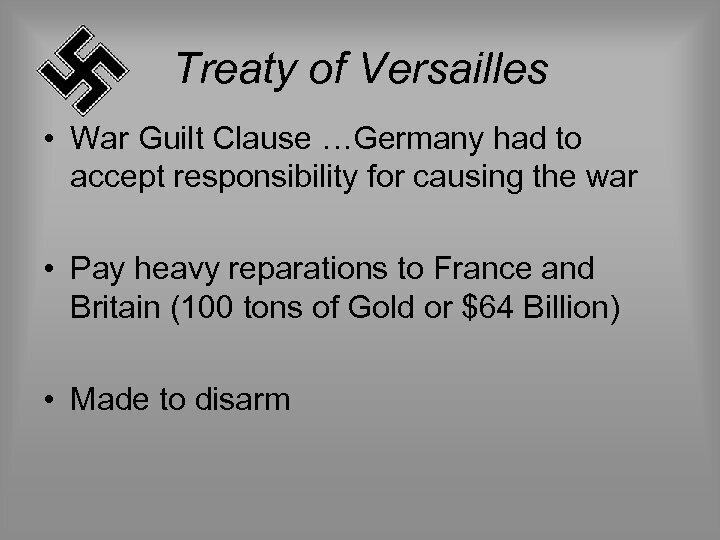 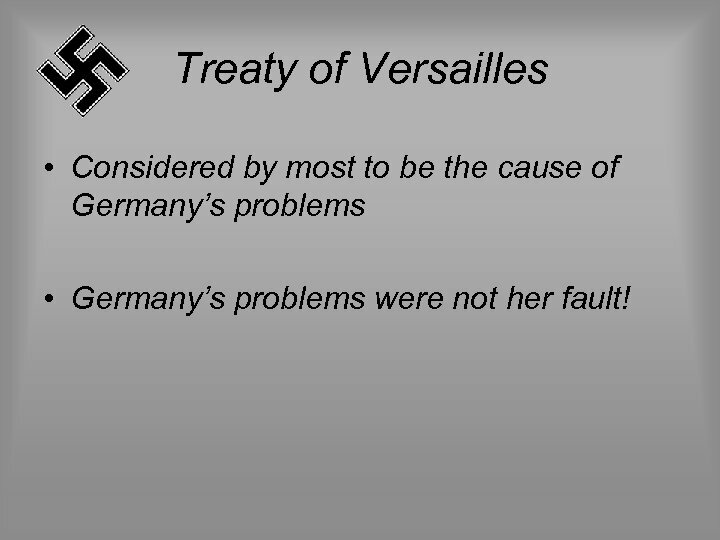 Treaty of Versailles • Considered by most to be the cause of Germany’s problems • Germany’s problems were not her fault! 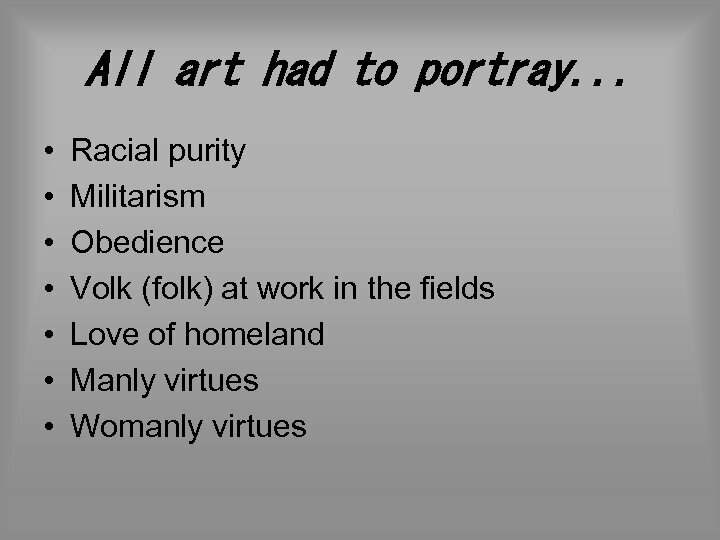 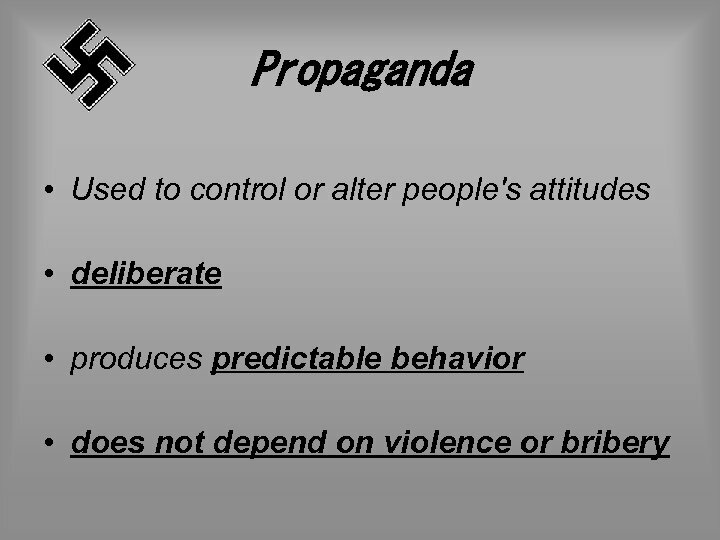 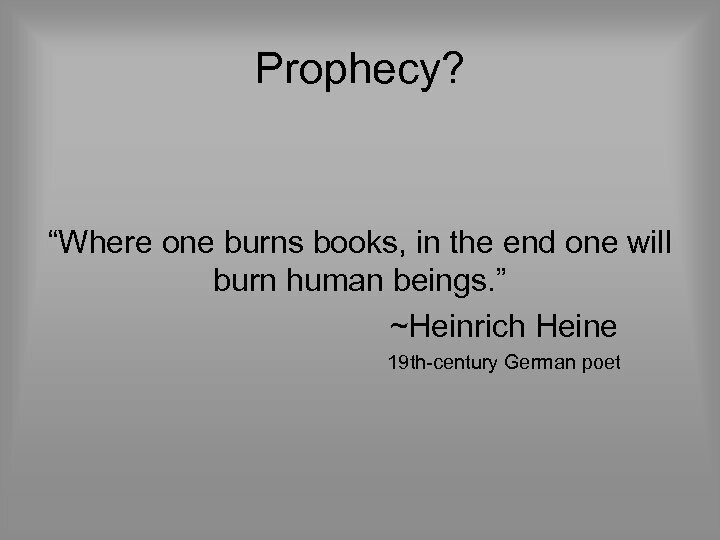 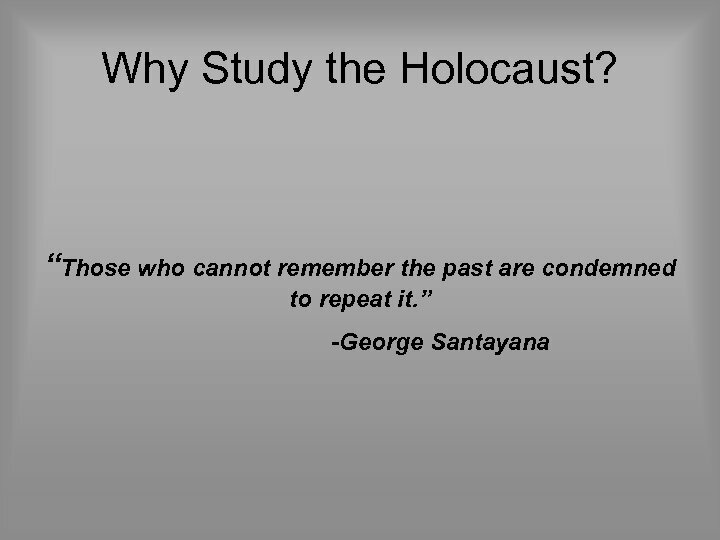 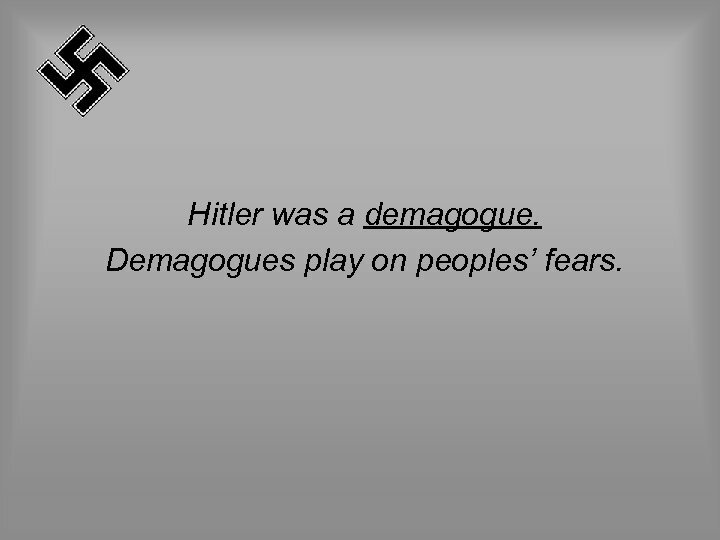 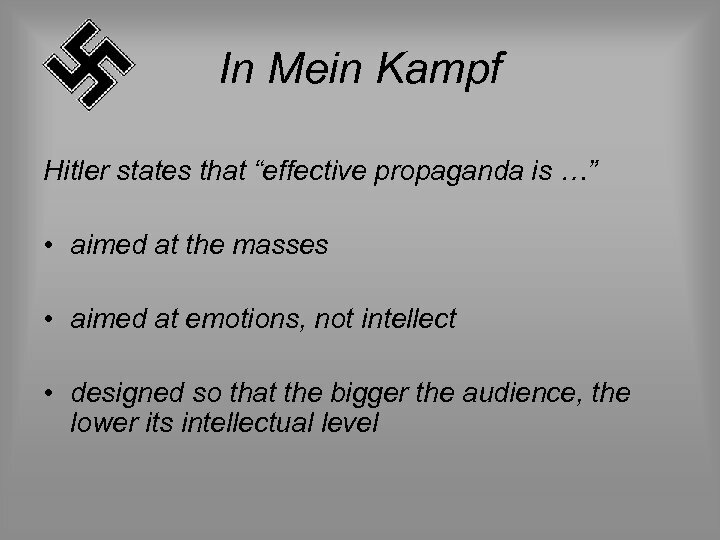 Hitler was a demagogue. 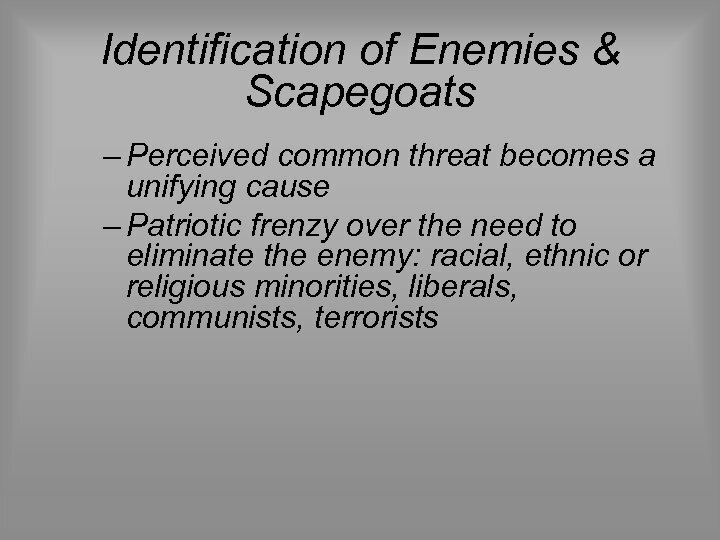 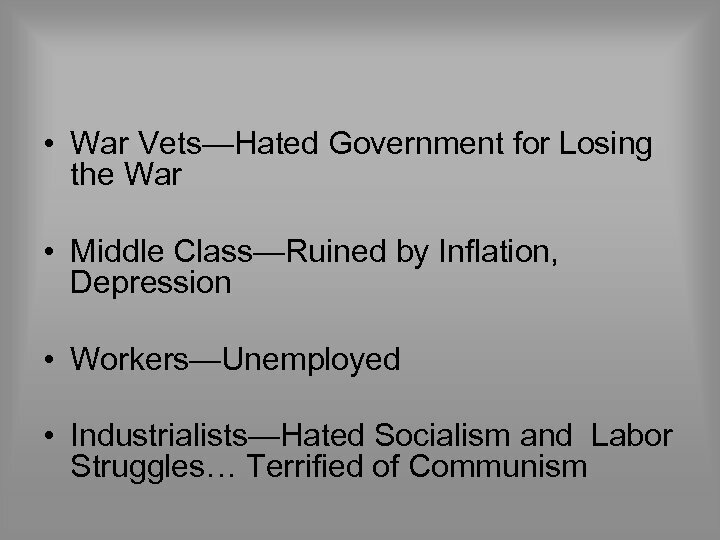 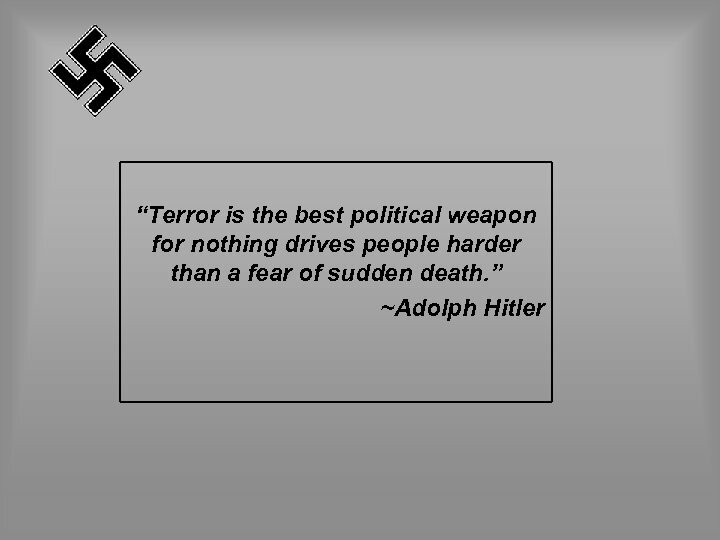 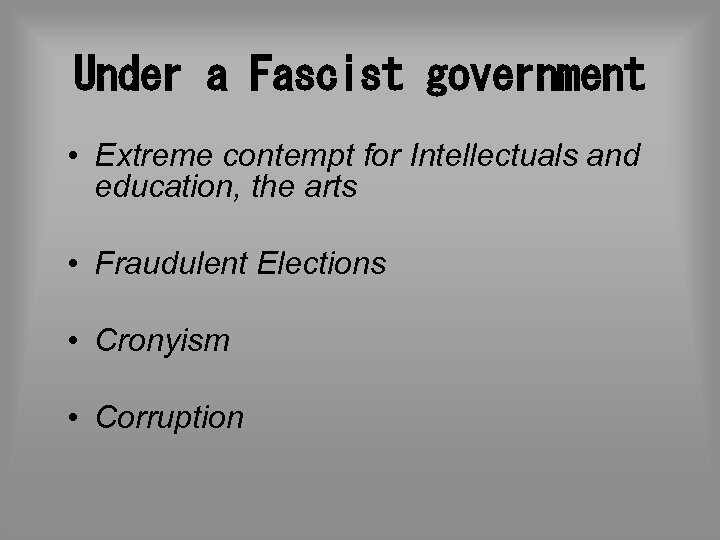 Demagogues play on peoples’ fears. 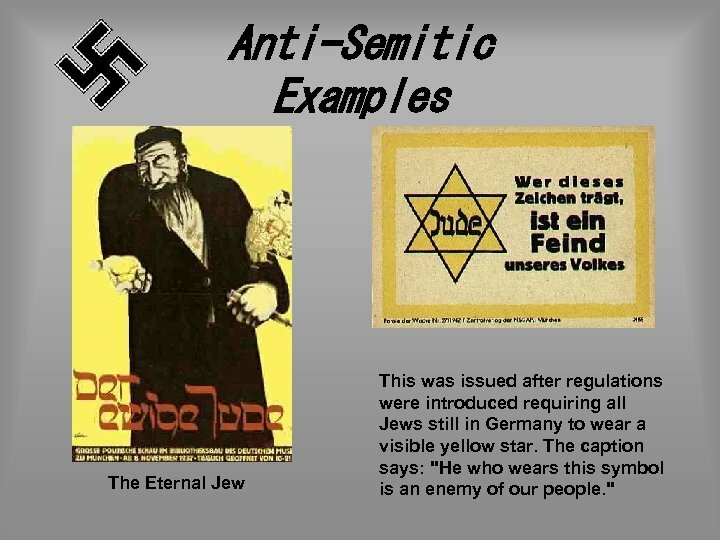 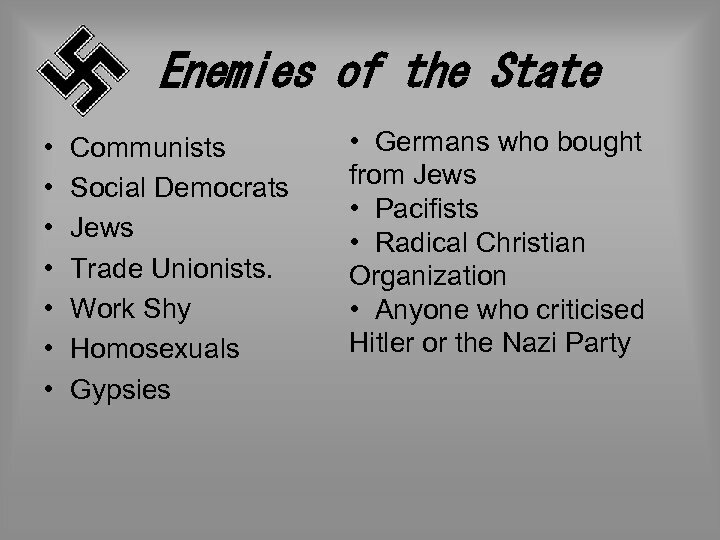 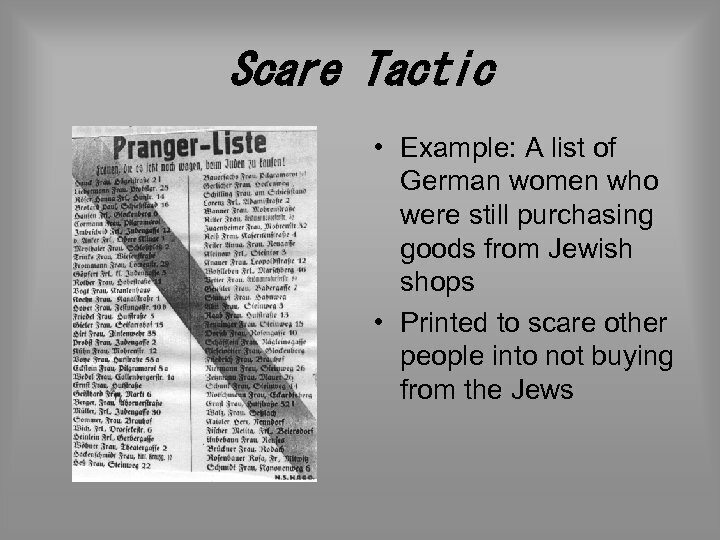 Anti-Semitic Examples The Eternal Jew This was issued after regulations were introduced requiring all Jews still in Germany to wear a visible yellow star. 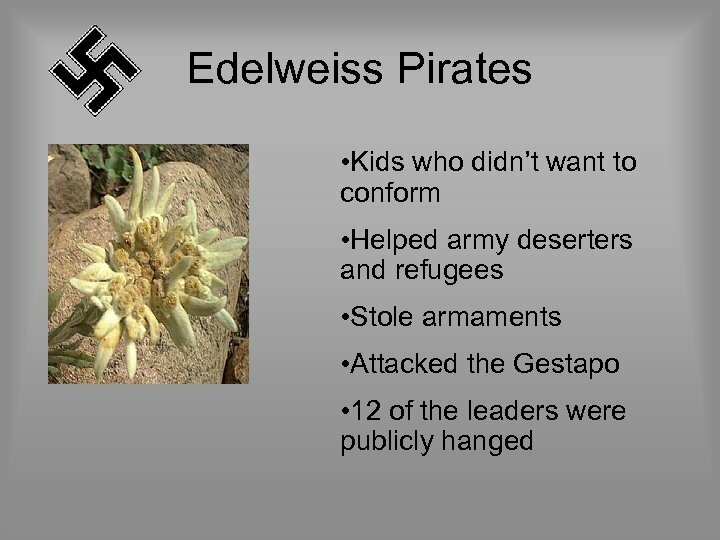 The caption says: "He who wears this symbol is an enemy of our people. " 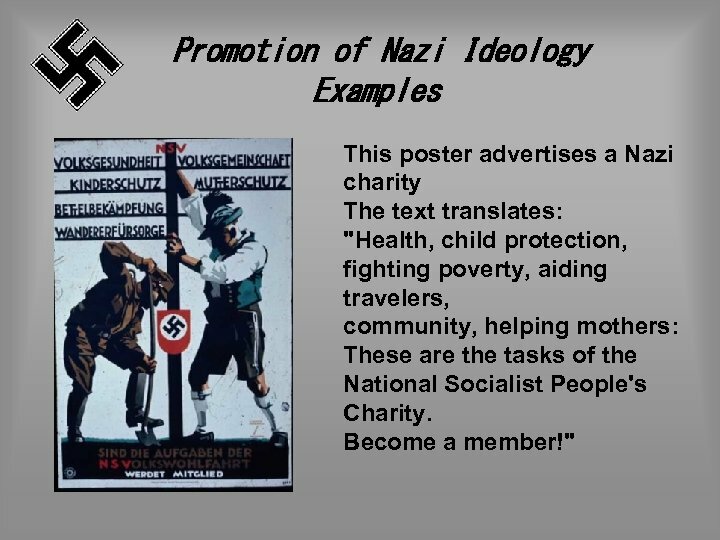 Promotion of Nazi Ideology Examples This poster advertises a Nazi charity The text translates: "Health, child protection, fighting poverty, aiding travelers, community, helping mothers: These are the tasks of the National Socialist People's Charity. 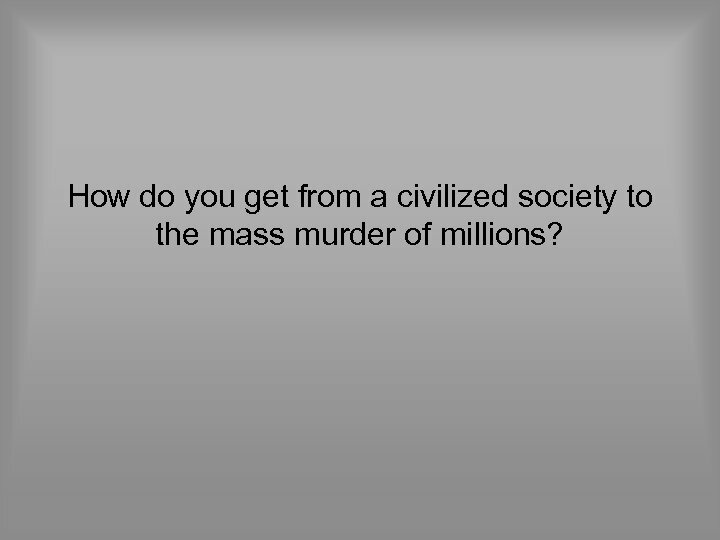 Become a member!" 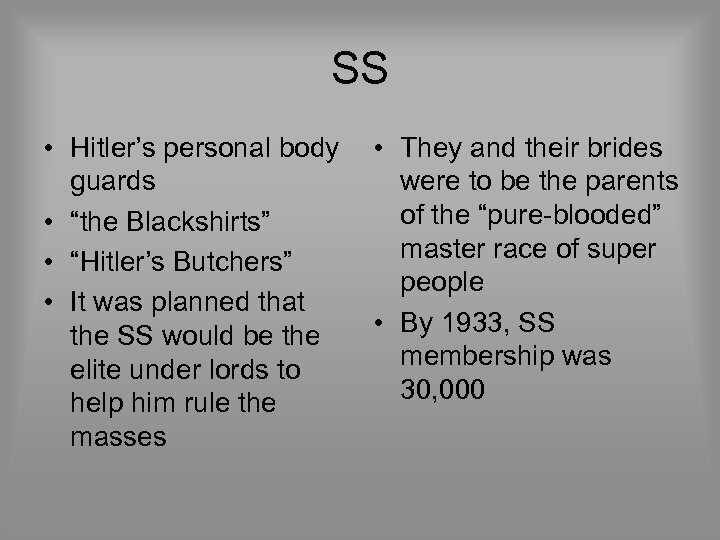 Examples cont. 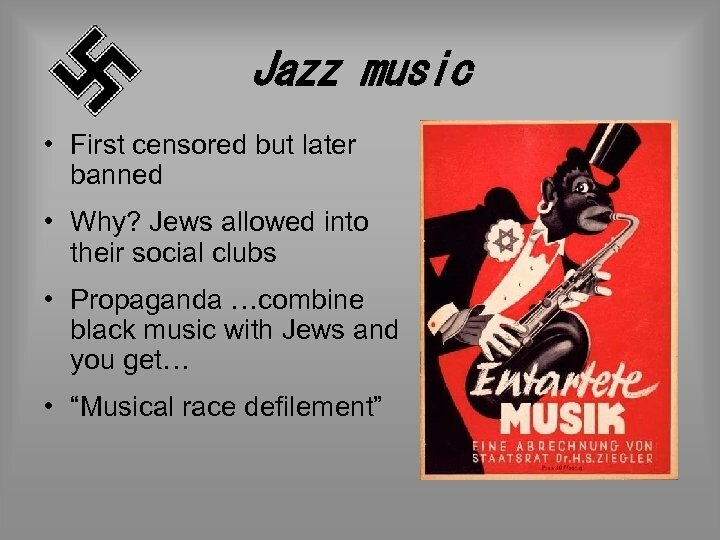 This poster from the mid-1930's. 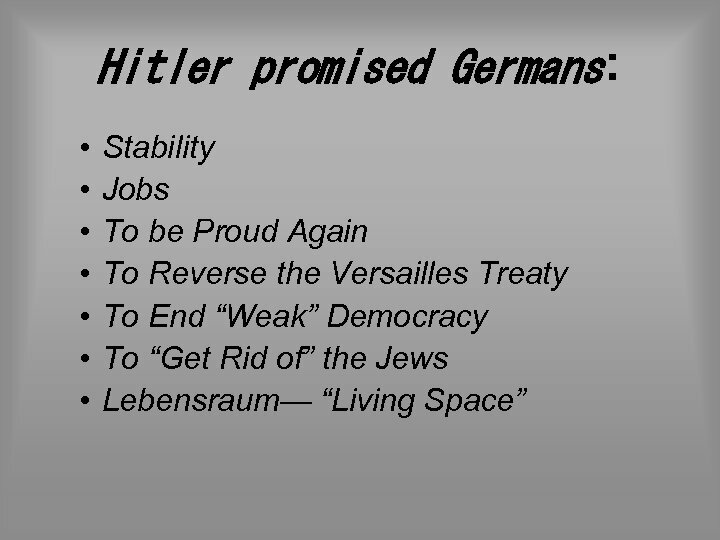 The caption: "Hitler is building. 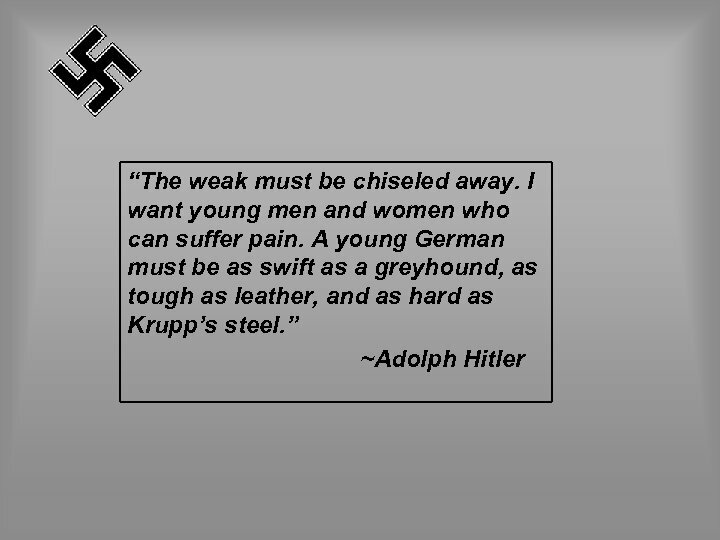 Help him. 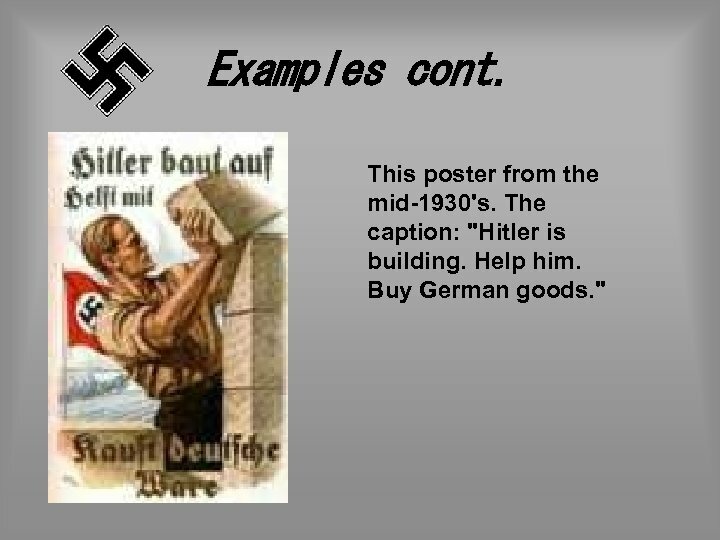 Buy German goods. " 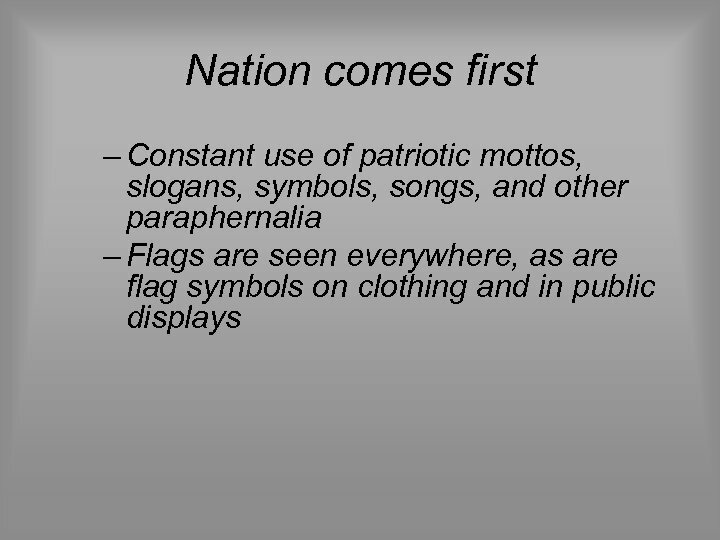 Examples cont. 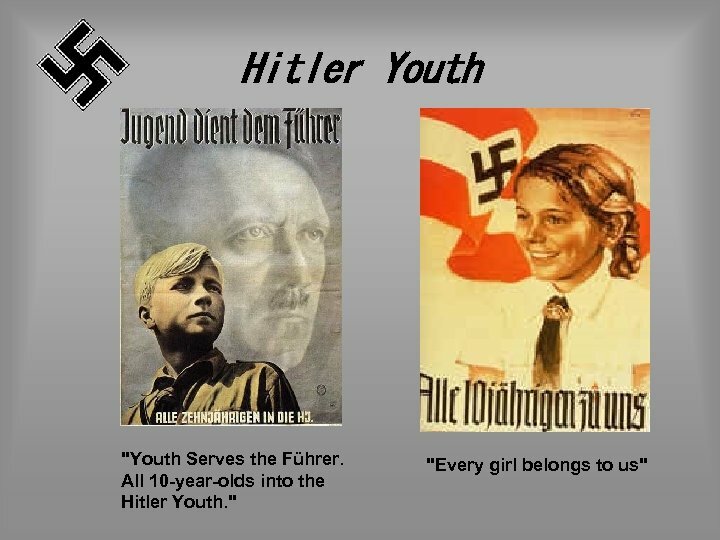 The text of this 1940 poster reads: "Youth Serves the Führer. 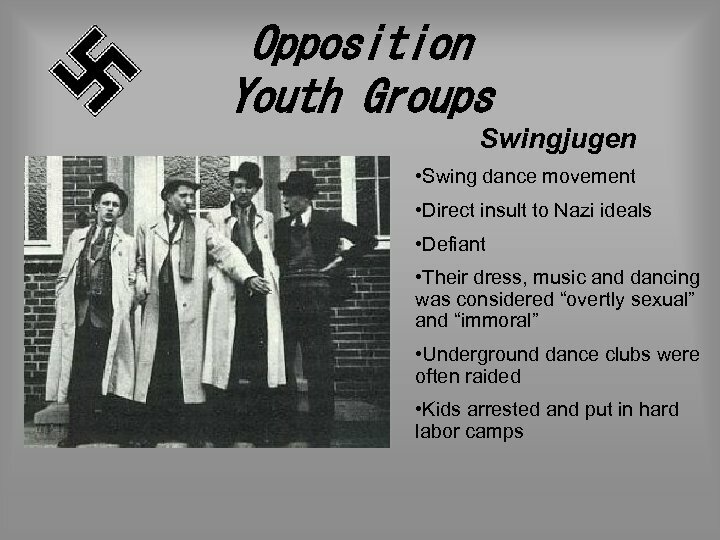 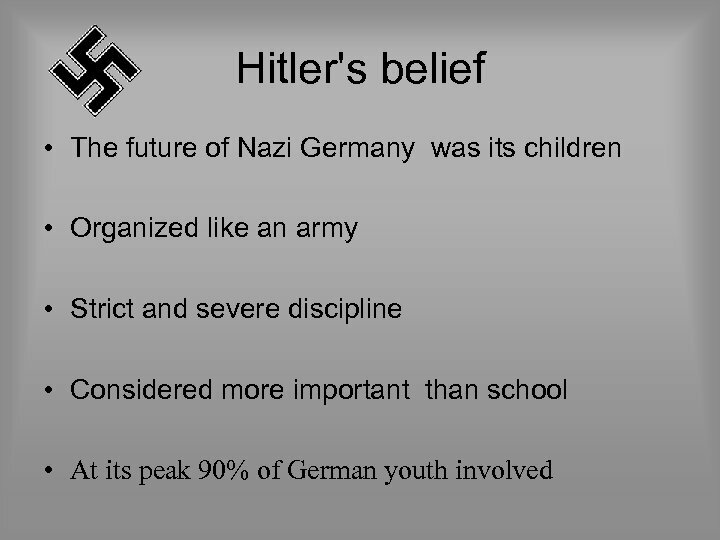 All 10 -yearolds into the Hitler Youth. " 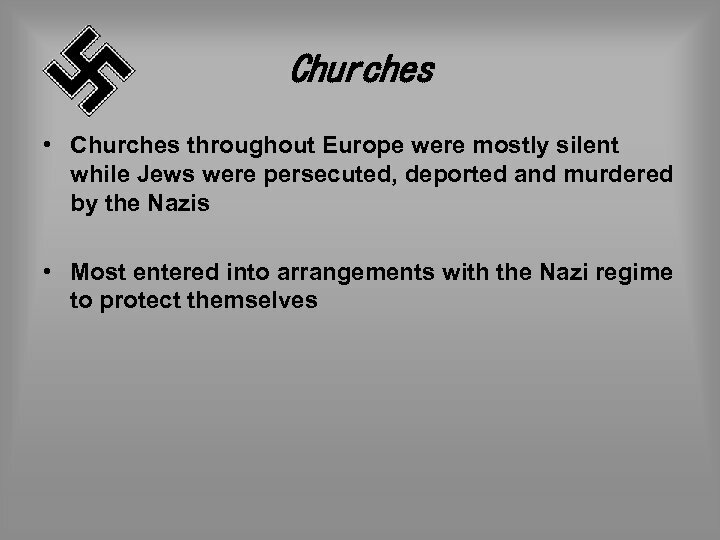 Examples cont. 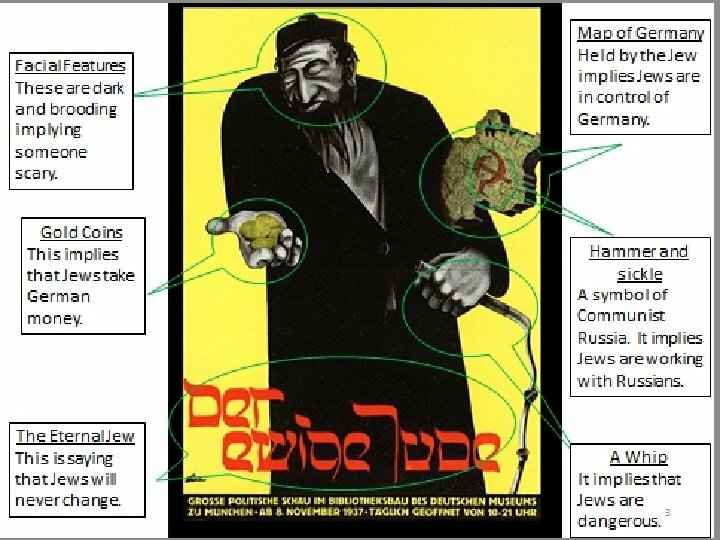 This 1938 poster was issued shortly after the Annexation of Austria. 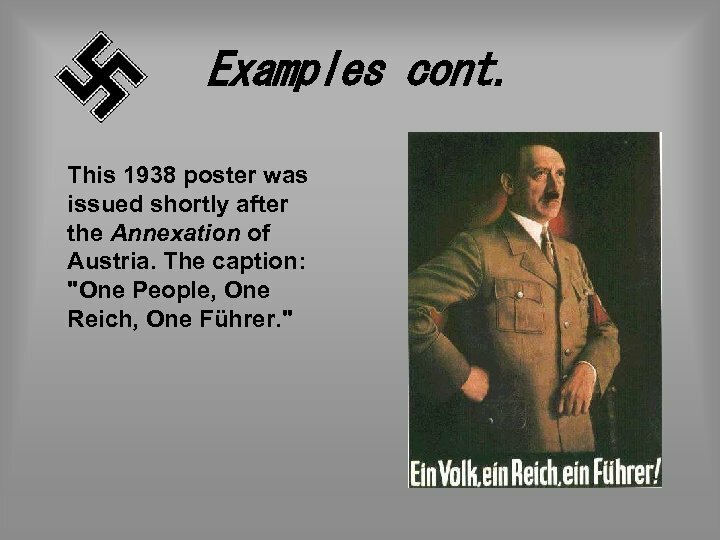 The caption: "One People, One Reich, One Führer. " 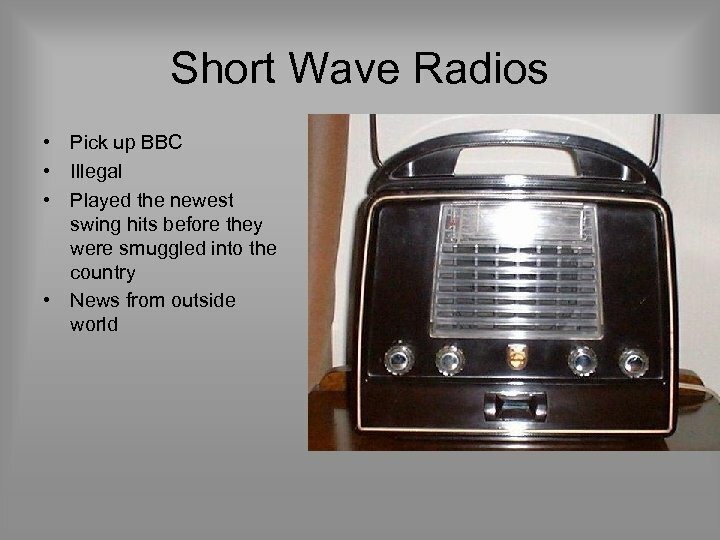 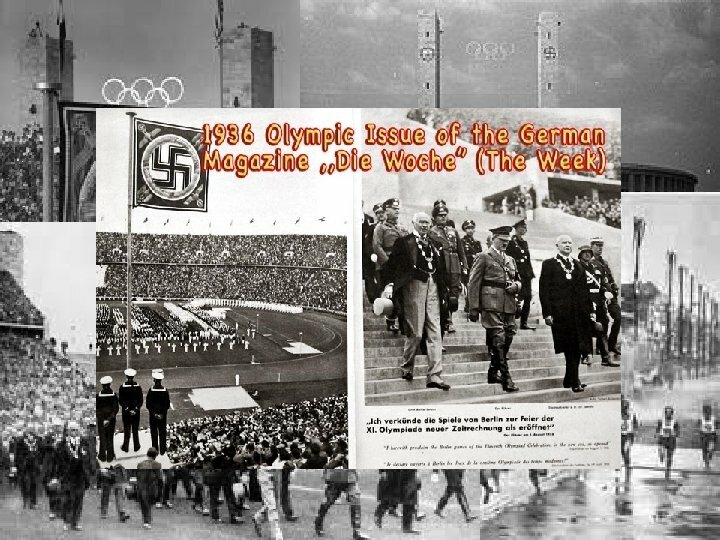 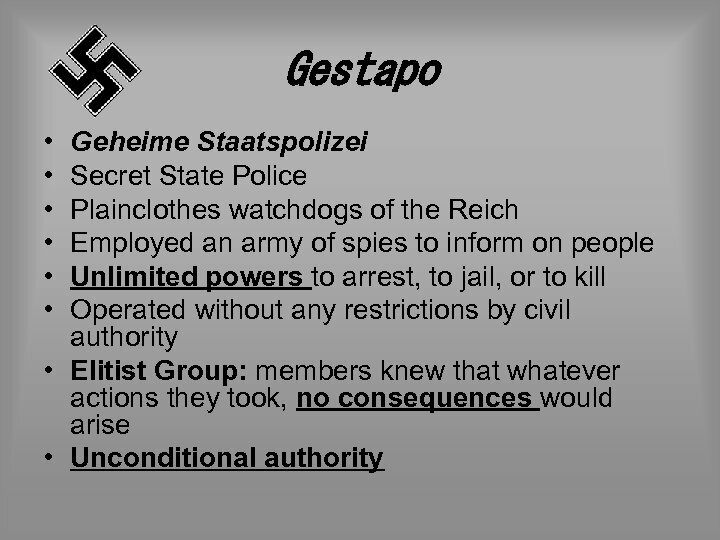 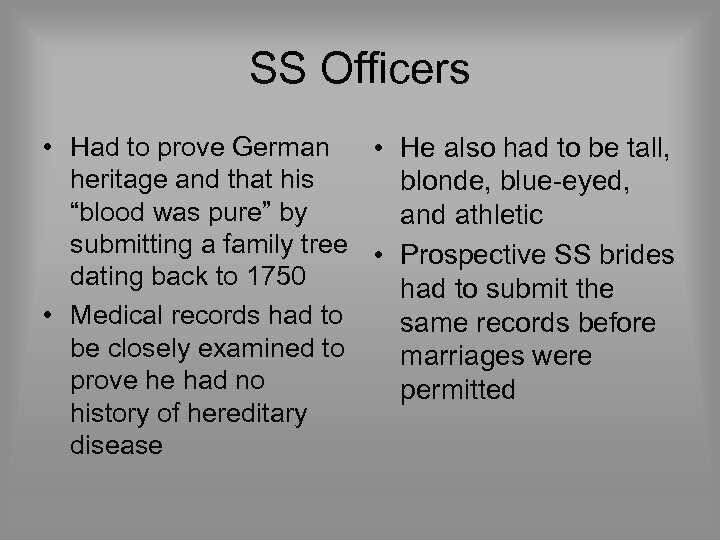 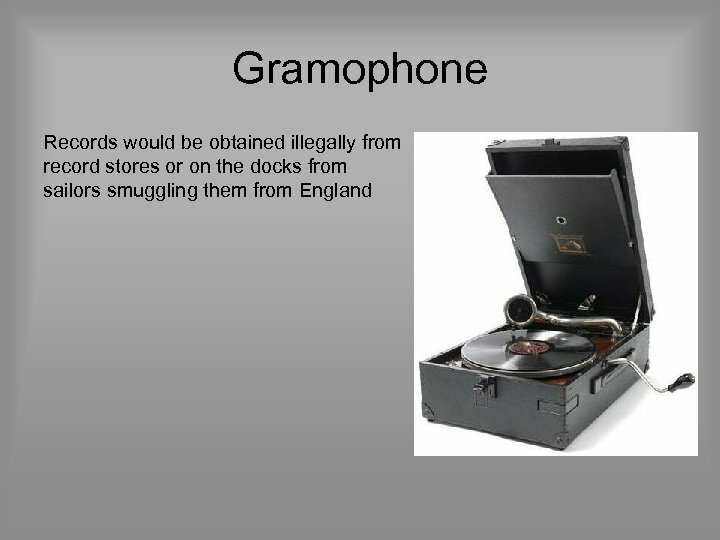 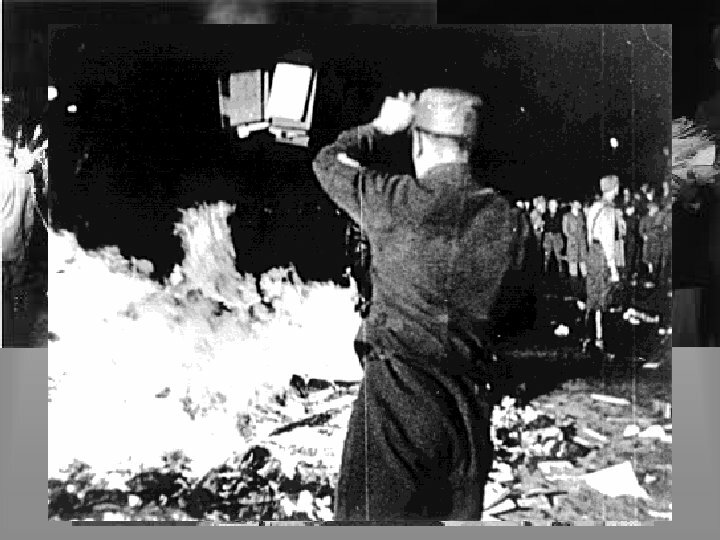 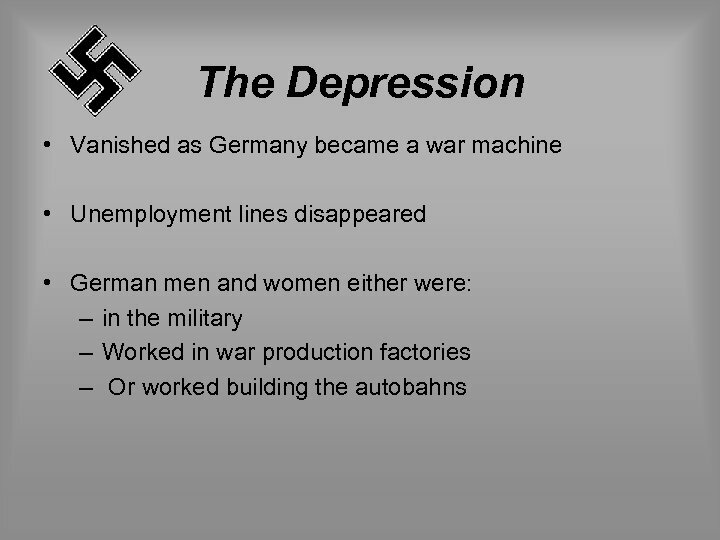 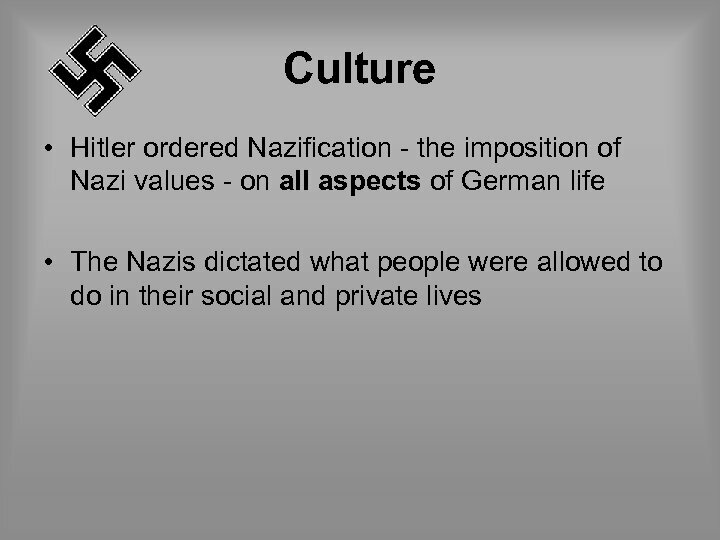 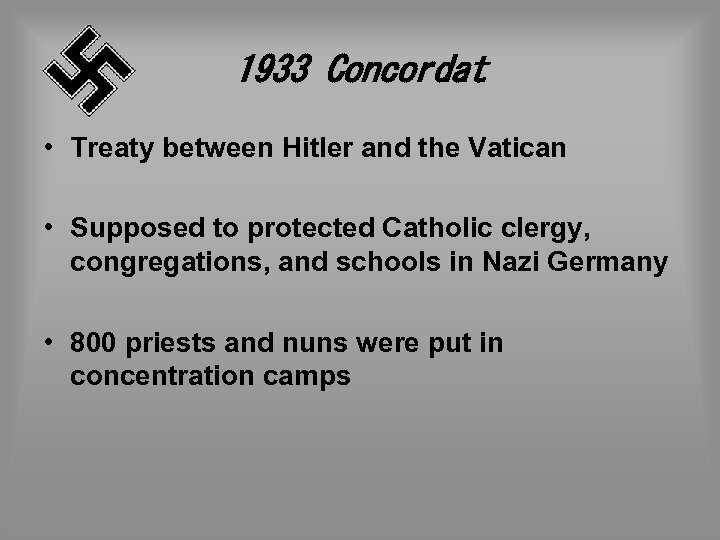 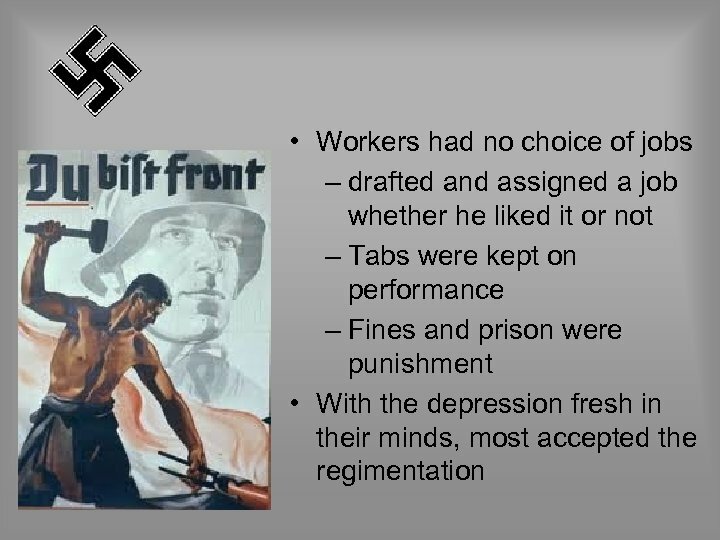 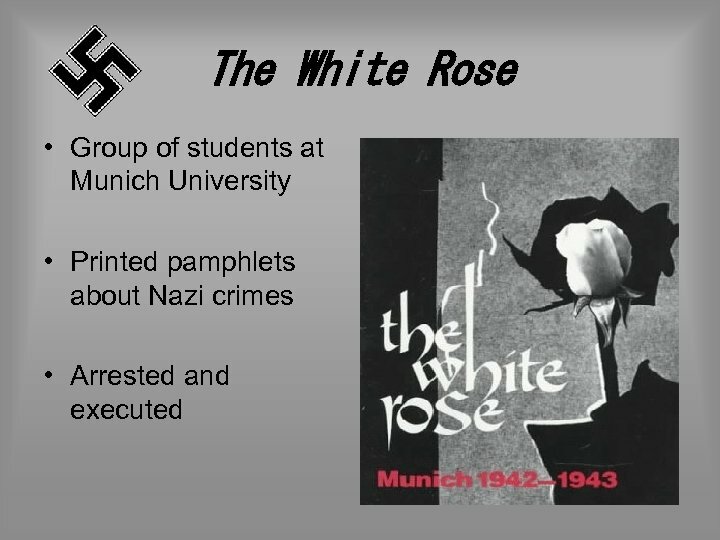 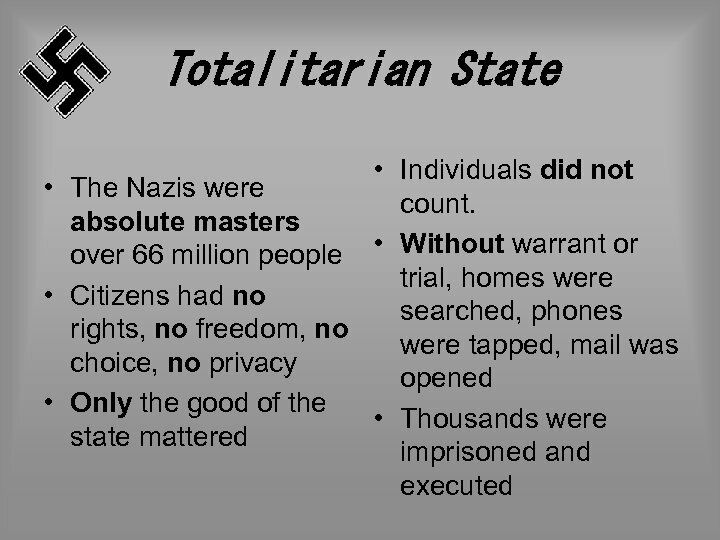 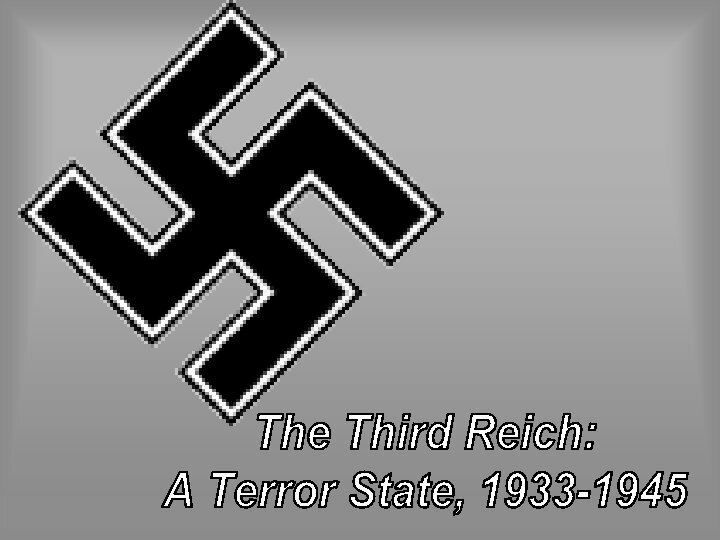 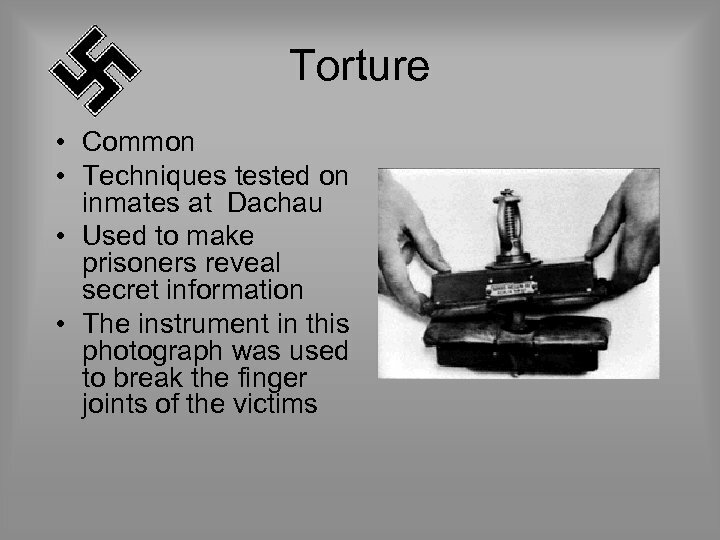 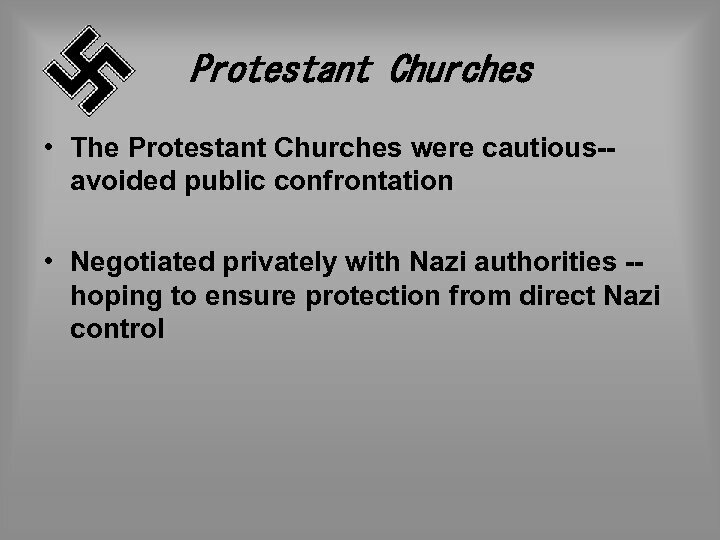 German Life • No phase of German life in the Third Reich escaped tight control • Citizens soon learned that as long as they didn’t question and did exactly what they were told, life was not really that unpleasant. 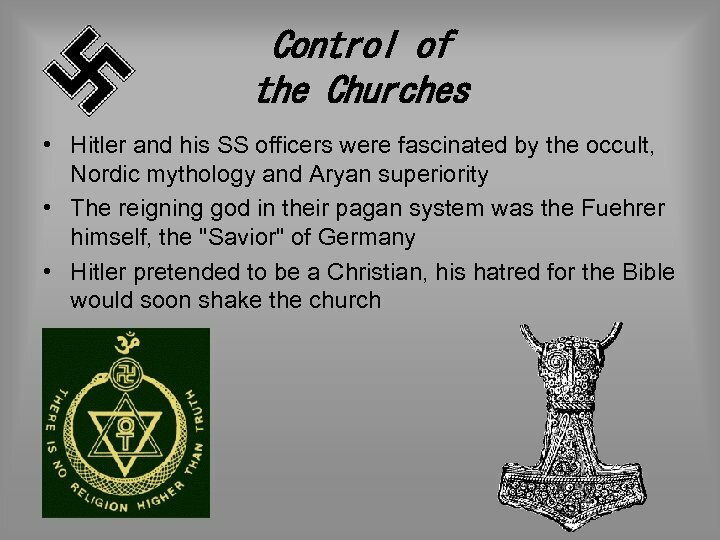 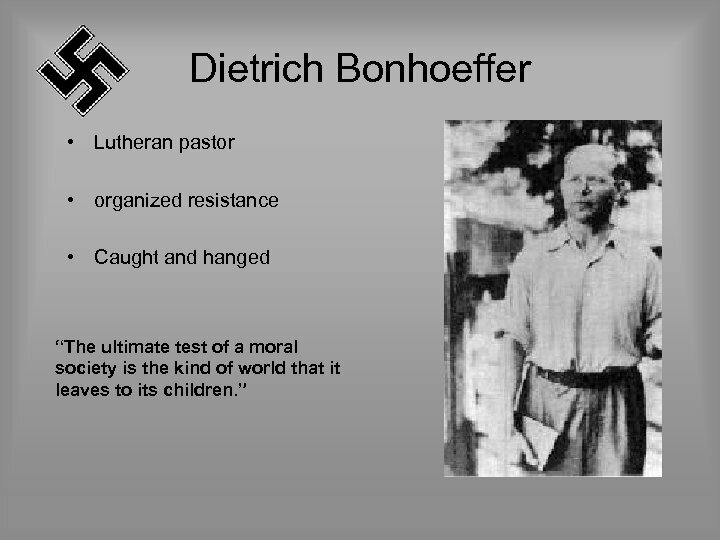 This poster makes the most direct Christological comparison with Hitler. 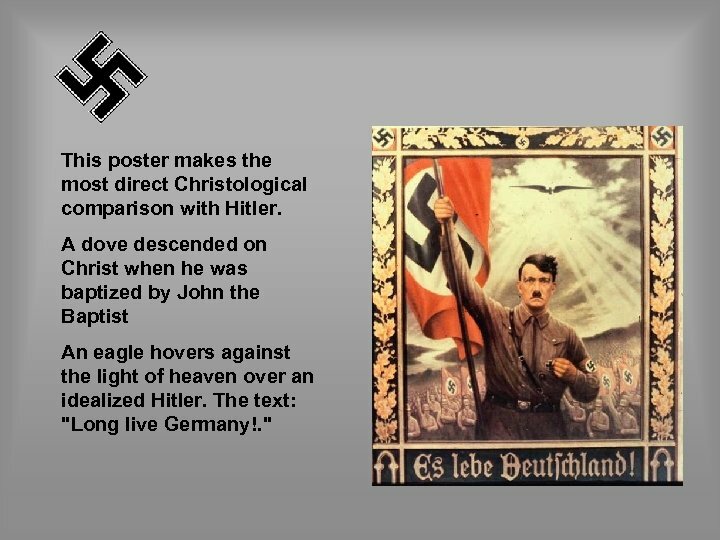 A dove descended on Christ when he was baptized by John the Baptist An eagle hovers against the light of heaven over an idealized Hitler. 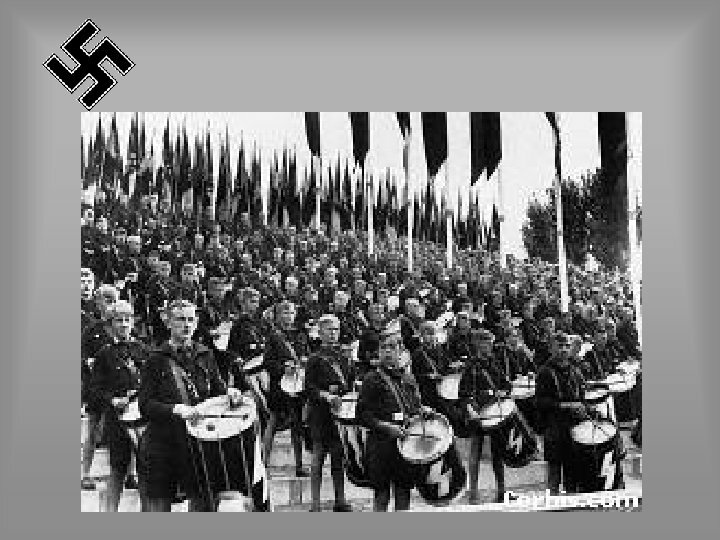 The text: "Long live Germany!. " 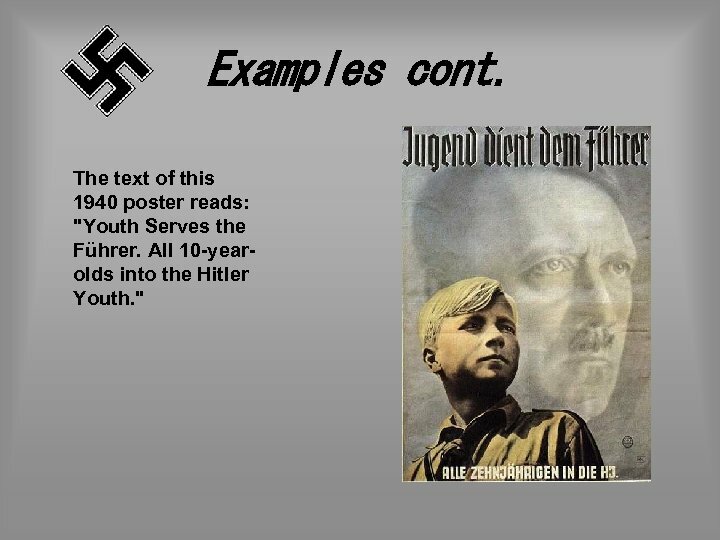 Hitler Youth "Youth Serves the Führer. 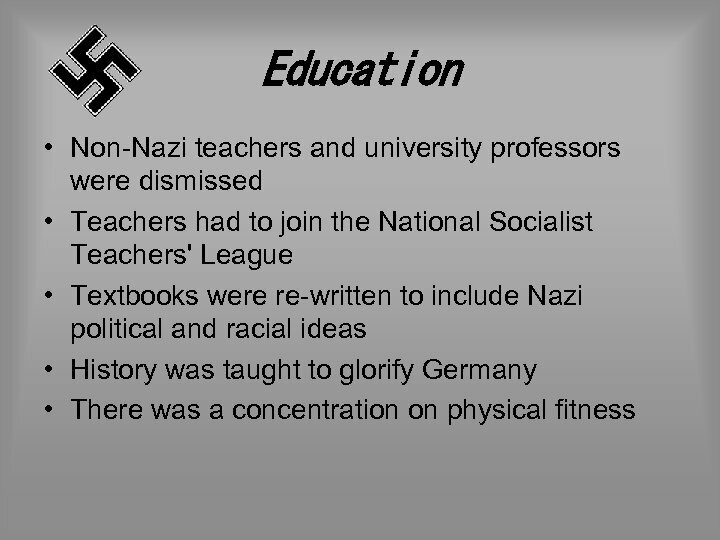 All 10 -year-olds into the Hitler Youth. " 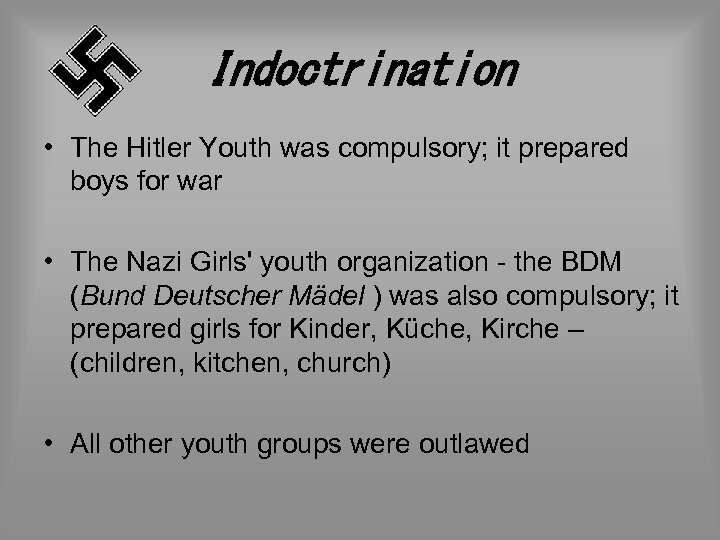 "Every girl belongs to us"
How do you get from a civilized society to the mass murder of millions?